It’s my birthday month! That means I get to reach into the jar of poker chips at Green Planet Yarn and see what discount I get. I know I will at least get 20%, but the chance at getting 40, 80 or 100% is so exciting. I pulled a 20% this time, but I’ve pulled 40% twice before. Anyway, I decided to redo my Vivian because the knitpicks yarn I used is pilling like CRAZY. I’ve tried to trim it, but it is really bad. And it was such a fun knit – I just hope I can do it twice! I bought Lorna’s Laces Shepherd Bulky, a 100% Superwash Merino Wool in the Cedar colorway. I’m not 100% confident of my color choice now. What do you think? The yearn is beautiful, especially outside in natural light. But in the house, the colors are reading a lot more yellow which is pushing it very camouflage army green. I hope will like it, 9 skeins is no small investment and I had the shop wind all the balls! No going back now… no starting tonight for me either 😦 I ran into a little snag after finally getting to sit down and play with my new yarn. I can’t find the pattern! This just happened to me two weeks ago. I was back from stitches, so happy with my Tosh DK purchase. I had Jared Flood’s Koolhaas hat in mind to make fo me. (Out of all the hat’s I’ve made, I never made myself one.) I go to the computer to print out a fresh new copy and can’t find it anywhere! I’m so bummed. I’ll just have to re-buy I guess. Speaking of Jared have to check out Jared Flood’s blog right now, especially if you are interested in spinning and yarn production and photography (his photos are stunning). He’s giving a “tour” if you will through the yarn production mill of his new line. Fascinating and beautiful! 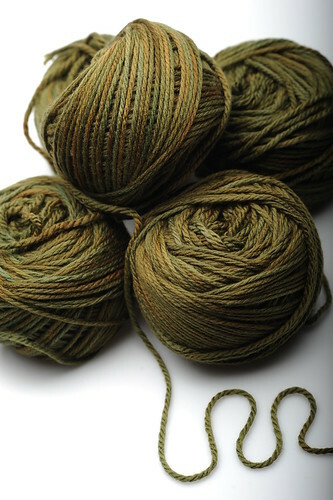 The green yarn in part 3 of 5 is gorgeous. I wish they had that in bulky weight at my LYS!! My little man has been getting sick a lot this year. This is his first year going to pre-school and before that he was watched at home. It seems like everytime he goes to school he picks up something new. Thank goodness we have a lovely doctor. She is so good with him. 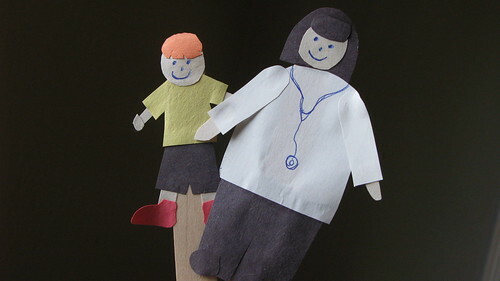 These two puppets are made from the toungue depressor that she didn’t need to use since my boy has become proficient at opening his mouth wide enough for her to check his throat. We’re going to give them to her as a present today when I take my little girl in to get checked up. If she doesn’t have anything contageous, then I get to go to knit night tonight! 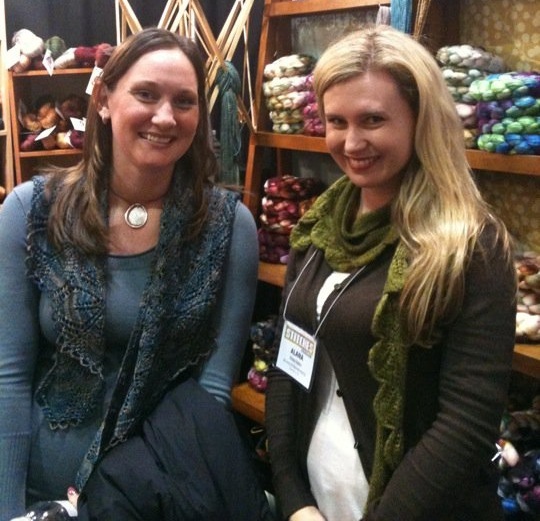 Stitches West – I met Alana! I didn’t have much time to be at Stitches West this year, just ran over during my lunch hour. But for that 1 hour I had so much fun! I got some buttons for my owlet sweater, some Tosh DK (georgeous!) in “oxblood” and the highlight of the show was running into Alana Dakis, designer, blogger and podcaster, from http://www.nevernotknitting.com/. 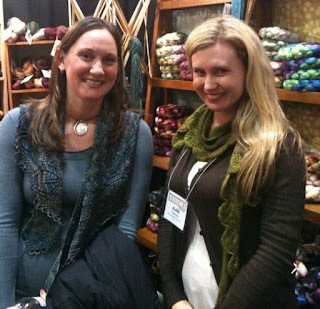 She’s one of my favorite designers and her blog definitely keeps me up to date on the new yarns and patterns that I must have! Now I just need to track down Ysolda Teague and I’ll have met all of my favorite designers 🙂 Also, she interviewed one of my dear friends from the Quilt Otaku blog, check out the podcast! !